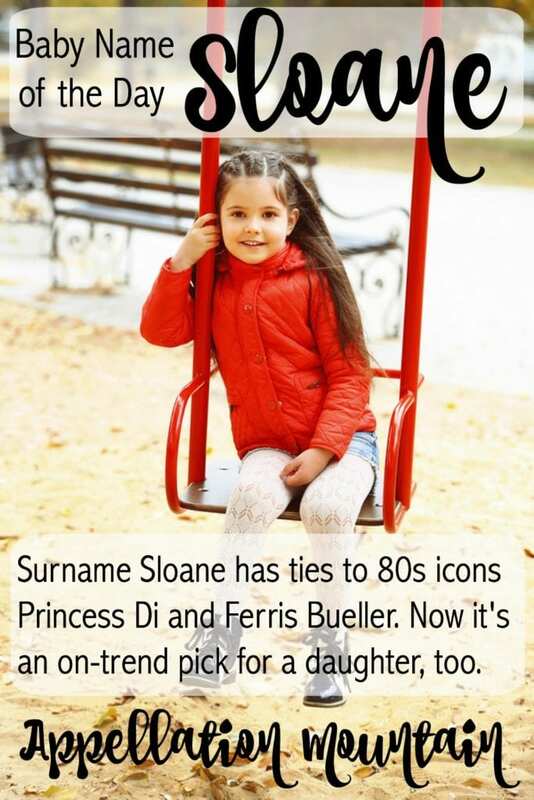 Sloane was launched by a 1980s movie and a world famous princess, but this surname name is just catching on now. Thanks to Christy for suggesting one of the names from her list as our Baby Name of the Day. As you can probably guess, this name started out as a surname. It comes from the Gaelic O’Sluagháin – raider. Along with pirate and marauder, it’s often used for sports teams. But in the 1980s, this name took on a very different association, thanks to Lady Diana Spencer. The woman who would be queen was part of a circle of young, fashionable, well-born Londoners called Sloane Rangers – after the name of the Chelsea square that served as their informal HQ. The world watched as Lady Di became a princess in a fairytale wedding, and we all learned the term Sloanie – the rough equivalent of Preppy in US slang in the 1980s. Bestselling “official” handbooks were issued for both. The square is named for Sir Hans Sloane, an eighteenth century physician and landowner, best remembered for donating a considerable collection of artwork to establish the British Museum. It was still the Reagan era when this name became a name, though. The year was 1986. Matthew Broderick was Ferris Bueller. And Ferris? He was taking a day off. The John Hughes classic sent Ferris on adventures across Chicago in the company of his best friend Cameron and girlfriend Sloane. Mia Sara played the girlfriend, wearing an unforgettable white leather fringed jacket. As high school girl characters from the 1980s go, she’s memorable for being level-headed, and very kind. The movie was a box office hit. Thirty years later, it remains a favorite for many. You might expect that the name would have taken off, bolstered by the combined power of Diana and Ferris. In 1980, seven girls were given the name, along with ten boys. By 1990, those numbers were 67 girls and 5 boys. 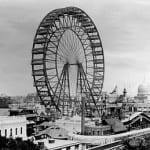 A handful of uses kept the name in the public eye: essayist Sloane Crosley’s best-selling I Was Told There’d Be Cake, and recurring Entourage character Sloan McQuewick, an on-again, off-again girlfriend for Eric. It might be the Entourage character who did the most to boost the name. She first appeared on the HBO series in 2005. That year, the name was given to 120 girls. By 2007, that number was 217. Eric’s girlfriend spells her name without the final ‘e’ – and sure enough, Sloan also doubled in use between 2005 and 2007, going from 56 girls to 115 girls. Even if the Sloan-sans-e tipped the name into wider use, the with-the-e spelling is much more popular. It broke into the US Top 1000 in 2008, and reached #327 by 2015. Sloan also ranks, at #699 in 2015. How high will it climb? The name fits with current trends. It’s a surname name for girls like top ten favorite Harper. Other S surname name possibilities, like Sutton and Sawyer, are also on the rise. And with many parents favoring nickname-proof names in every style of name, this is definitely one that could appeal. But for now, it remains a familiar, but not too popular, pick for a daughter. What do you think of Sloan/e? Do you prefer it with or without the e? This post was originally published on August 12, 2010. It was substantially revised and reposted on May 30, 2016. Just came across this discussion….by all means call your daughter or son ‘Sloane’ or ‘Sloan’ but I’m afraid for the greater proportion of the upper classes and aristocracy it’s a label and will be laughed at. It won’t be much different with working class reactions: those people will see it as a social climber’s try at being ‘posh’ and will either resent it or laugh at it too. Poor child who gets it as a name. Suggest parents think of something else !! The name has a different connotation than in Britain. Most Americans associate the name with iconic pop culture and nothing to do with Sloane square. I’m vibing on it, because we’re staying in a hotel in Slovenia called Slon, pronounced Sloane. It means “elephant” in English. I also think of the Sloane Rangers and the lyrics from Morrissey’s “Hairdresser On Fire”. It’s chic and uncommon and creative. Sloane is an awesome name — sounds strong, assured and cool as a cucumber. I’m so surprised at the popularity of this name and the thinking that it’s so new. We named our daughter (born Jan. 2016) Sloan in memory of my grandfather. He was given the name in the 1920’s. I hated reading some of the posts online about how pretentious it is and wish I hadn’t read those things! We love our happy little baby! There’s also a character from Grey’s Anatomy named Mark Sloan. Several seasons in he finds out he has a grown daughter named Sloan after him. 2. I think it’s a name nerd name right now, but will go up in the ranks as people move on from the current trendy names in search of something else. I love Sloane – I too, put Sloane into many of my stories for a few years. Ah, name crushes! My ultimate problem with it was the no-nickname thing, but I love the idea of “Lolo”. Eh, it repulses me. Few names do that. It makes me think of a slug taking its dying breath or something similar – sloooooaannnne. Perhaps something Gollum would utter? On par with Spermo or Sexburga in terms of general ugliness. I have to agree! Sloane sounds terrible, and it is an insult in the U.K. Frankly, it’s a bit much to assume the child will never meet one of the millions of people to whom this is a negative slang term. I mean, I wouldn’t name my child something that was a negative word in America even though I am not American – we live in a global community. We’re considering this name and live in Canada I’ve asked everyone I can think of with a tie to or friends in or who have lived in the U.K. and no one has made the negative connection yet. I don’t know that it’s all that well known as your post suggests. Sarah, I agree with you. I think we all forget how quickly cultural references fade, and how dramatically perceptions can change. The Sloane Ranger references are nearly 40 (!!) years old. Ask a teenager today about Ferris Bueller and most of them will reply, “Who? !” Combined with the increase in girls named Sloane, I think any stigma will continue to fade … if there is any left. I love love love this name and am so disappointed that it’s been tapped to rise. I almost wish we had named our daughter Sloane Lorraine instead of Helena Lorraine (Lorraine is a family name) because she has such a headstrong personality which Sloane just seems to fit, and it dawned on me later that we could have called her Lolo or Lola for a nickname. It’s still in the running if we have another daughter. Do it, Christy! What’s your middle name choice?? Her name would be Sloane Paula (after my mom). Our other top 2 name is Harper Paula. I am just scared of Harper becoming the next Madison, though it seems to still be somewhat uncommon. I am very surprised to read all the negative commnents about the name Sloane. Not that I care as it is a personal decision after all. My husband and I go back and forth on these 2 names regularily…. less than 3 months until we find out if baby is a boy or girl. We are pretty much decided on the name Cooper if the baby is a boy. Honestly, nearly ANY name that isn’t common gets mixed reviews, and if it is common, it gets a lot of “oh, I love it, but I know three.” (See what I just wrote? I include myself in people who say we love unusual but often react negatively until the name is more common.) It’s very rare to land on a truly unusual name that generates nothing but enthusiastic responses. We almost named our daughter Sloan Lorraine! Sloan from my grandfather and Lorraine from my grandmother. We ended up using Sloan Laura for my husband’s mother. I wonder if John Hughes was making up for being plain ol’ John, or if he really just had a knack for naming? You’re right – he really chose some amazing character names. I don’t hate Sloane and I can see why other parents might embrace it, but it’s too tied to the Sloane Rangers for me to even consider it. I’ll stick with the similar sounding Joan. John Hughes has inspired a lot of baby names: Cameron, Claire, Samantha, Jake, Ian, Miles, and Wyatt. I’m just surprised Sloane hadn’t made the top 1000 much earlier. This is one of those surnames I simply don’t see the appeal as a first name. Riley, Madison, Addison, Taylor – even if those aren’t my style, I understand why parents would find these names pleasant for their little girls. But Sloane is an exception. It sounds and looks ugly, it has zero femininity and no nickname possibilities. I can’t think of a namesake or a positive association for it. It reminds me of “slow” and “slugs” too 😛 I don’t get what people see in it. I think I’d take Mildred or Ethel any day of the week! Yes, Charlie Sloane and his somewhat unfortunate family are what come to my mind when I hear the name Sloane. It’s a non-starter for me as a result. I wondered about that, JNE. I’ve heard Sloanes described as the equivalent of preppies, which I never thought of as a put-down, exactly. But Sloane does seem to have more of an edge. I’l never forget Arvin Sloane from Alias. :D I think it’s a good pick for people who like contemporary names. I’m surprised you didn’t mention the Sloanes on Grey’s Anatomy in your post! 🙂 Dr. Sloane’s estranged daughter was named after him, and her first name was Sloane. I thought for sure that might have something to do with the name rising in popularity. I concur that Sloane Peterson had a lot to do with this name’s current coolness. I was in jr high when I saw it and I thought she was SO beautiful and cool. I mean, who didn’t want to be Ferris’s girlfriend? I think the Madison factor is definitely at play with this one. Yes on the white, fringe jacket! Mia Sara was so gorgeous and effortlessly chic. Sloane seems like the name of the nicest cool girl at school. I love it. Thank you so much for making Sloane the name of the day! I disagree 100% with photoquality saying ‘someone was maybe a little silly if she were to name her daughter Sloane’. I think it is a great name and it is still at the top of our list if our child due in October is in fact a girl. And by no means do I feel that I am being silly. Thanks again for a great post as always! Sloane remains one of my favorites. I don’t love it with our last name, but I do have a thing for the “o” sound! An enthusiastic & passionate vote for Sloane ! And by the way (here’s my third post already) Sloane Peterson was played by Mia Sara, and Mia was another name I thought was very cool. I was an English major with a concentration in Creative Writing in college in the late 1990s. Sloane was a featured character in many of my short stories. I was so in love with the name. It seemed like the epitome of cool: a short, boyish name, who evoked images of a white, fringed jacket and gorgeous long hair. (Yes, that’s Sloane Peters, I’m talking about.) I also have a cousin named Sloan. A male cousin. As an adult, I’d say this name isn’t for me. Because it recalls my less mature days, it seems like a name a teenaged mom might pick. But as a teenager, looking for “new”, interesting names for my stories, with a developing interest in naming, Sloane was The One. So, I like it in retrospect, but would think someone was maybe a little silly if she were to name her daughter Sloane. Am I making any sense? Do I ever? Ugh. Peterson. Typo, not misremembering! I think it is like any name that you once loved. Even if it was never popular, or even common, it was so present in your mind that it feels over. And I once suggested naming a daughter Verity – but Arthur thought that was weird. It was my screen name, so it seemed like the name was already taken … except that it wasn’t really. […] indie flick Guinevere won accolades. […] an eye on Sloane, too.